In this file photo, Tyler, the Creator performs on Bacardi Sound of Rum Stage during the 2018 Life Is Beautiful Festival on Sept. 23, 2018 in Las Vegas, Nevada. 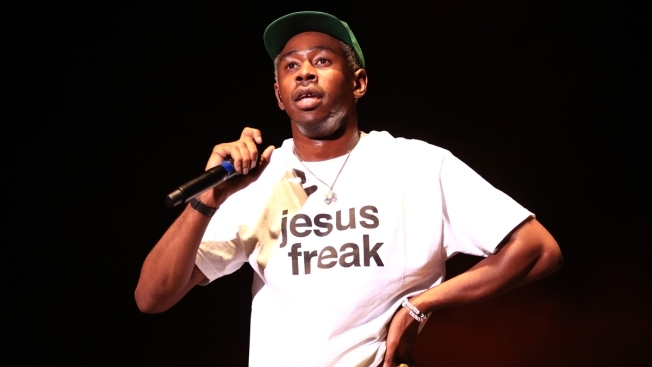 Rapper Tyler, the Creator was involved in a traffic collision early Thursday morning in Los Angeles. The Los Angeles Police Department and Los Angeles Fire Department responded to a call at around 12:30 a.m. about a traffic accident involving a white Tesla Model X at the intersection of Veteran Avenue and Sunset Boulevard. According to LAPD officials, the Tesla belongs to the rapper, whose real name is Tyler Okonma. The car struck a parked vehicle, pushing it about 50 feet from where the collision happened. Tyler, the Creator is also a record producer, music video director and is a Ladera Heights native. No injuries were reported and the artist could not immediately be reached for comment.